The Trump administration defines Iran as one of its top foreign policy threats. This is mainly due to Iran’s support of proxies in conflicts such as Syria and Yemen, its ballistic missile program, its support for terrorists in the region, and its desire to become a nuclear power. Under the belief that Iran is actively seeking to become a nuclear power, the Trump administration has ramped up its threatening rhetoric towards Iran in the past year, signaling a trend toward potential military action against Iran. But a direct military intervention against Iran is not the right next step. The Joint Comprehensive Plan of Action (JCPOA) began under the Obama administration with the support of China, France, Germany, Russia and Britain. The deal required Iran to reduce its stockpile of enriched uranium, halt production of weapons-grade uranium, and allow International Atomic Energy Agency (IAEA) inspectors to enter any nuclear site in the country. All other countries involved in the JCPOA have remained fully committed to seeing through the agreement and have derided the U.S. for leaving it. Any military strike into Iran would endanger lighting a short fuse which would set off a regional conflict and exacerbate already existing conflicts. The scope of the civil wars in Syria and Yemen would change drastically as allies of Iran and the U.S. in the region would be forced to choose sides or risk being drawn in on terms they did not choose. Iran, the U.S., and their allies and enemies, are main actors in the conflicts. The wars would begin spilling over borders, both physical and ideological, and potentially spark even greater clashes. A military strike against Iran could only be justified in a few scenarios: If Iran stopped working with the IAEA, or if it began a full sprint towards producing weapons-grade uranium. The IAEA concluded that Iran, since entering the agreement, has fully complied with the JCPOA. If Iran was to be caught increasing its amount of centrifuges or enriched uranium, it is likely that it is only doing so to increase its political standing, not build a nuclear bomb. This means the Trump administration using Iran’s nuclear program as a justification to strike, directly or indirectly, against Iran would be disingenuous. Yet the U.S. military is stretched too thin across the Middle East for a full assault. It is working to counter ISIS in Syria and Iraq, engaged in Afghanistan, while also keeping a wary eye on the growing conflict in Yemen that has no end in sight. There is little-to-no public support at home for more intervention in the region. When the U.S. and Britain invaded Iraq in 2003, it was based off of a lie from then leaders President Bush and Prime Minister Blair that Saddam Hussein had WMDs. Their lies sowed distrust for their governments in U.S. and British citizens. For Trump to claim that Iran is developing weaponized-uranium as a justification for a military intervention, would require a 100% guarantee. Even then it would still be considered suspect. This is compounded by the fact that President Trump won his presidency based on a non-interventionist platform in the Middle East: “We will stop racing to topple foreign regimes that we know nothing about, that we shouldn’t be involved with.” Conducting a military strike directly into the heart of Iran would be the opposite of his campaign platform and his constituent’s wishes. Aggressive action further risks alienating foreign powers that the U.S. wants to make deals with- such as North Korea. They will see that the U.S. created the JCPOA, withdrew, and followed up with aggressive action. This will lead foreign powers to believe that the U.S. is not capable of keeping its commitments. Furthermore, military interventions are rarely conducted unilaterally. The Trump administration would need support from allies, some of which are current JCPOA signers. 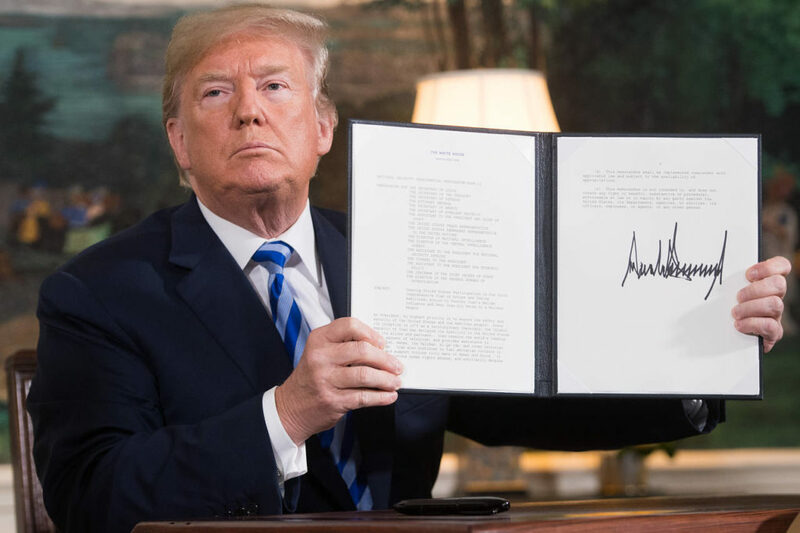 Yet by leaving the agreement, the U.S. has sidestepped its leadership role in pursuance of nuclear deterrence against Iran. Poor relations among the JCPOA states with the current U.S. president means they would not have a leader to trust in the intervention. As far as they are concerned, they would be left sifting through sand for the next decade. A U.S. military intervention into Iran would be at best unsupported. Putting military pressure on Iran will only force it into a corner, where it will double-down on its acquisition of nuclear materials and further expand its nuclear program. It is possible to deter Iran’s development of nuclear weapons without military intervention. It has been done before and it can be done again. Timothy Davis is a freelance writer and graduate student in the International Relations program at New York University. His focus is on U.S. national security in the Middle East. He has previously published in the Stanford International Policy Review and for the Young Professionals in Foreign Policy on Al Qaeda in Syria.